Yes, you've seen it before, a couple of times! I just snapped this photo Wednesday of this week, one of my favorite spots on the way to my daughter's school. 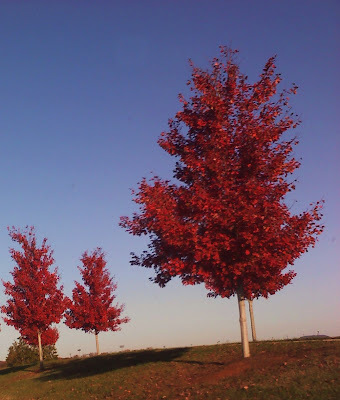 I have painted these red trees with the clear blue sky behind them, at this spo,t two diffterent times...but I had to snap it again! Enjoy more sky photos at http://skyley.blogspot.com/. Its worth repeating!!! Lovely view. I do it too. Each year I take the same pix but they do grow a bit more each year. You should put them together and see what changes there are. Any word on your show? How long will it be going? I can see why you like this view. It is beautiful. I do, perfectly, see why you keep returning to this spot. I think I would too.